NSW Labor has pledged to provide a Nurse Walk-In Centre for Gosford families and to ease the pressure on the local emergency service department. The announcement coincides with Labor’s new approach to health and hospitals on the Central Coast, according to Opposition leader, Mr Luke Foley MP. “Gosford Hospital’s emergency department (ED) has some of the longest waits in the State and almost half of the emergency department presentations are in the least two urgent categories,” Mr Foley said. The free Nurse Walk-in Centre is based on similar models in the United Kingdom, set up in 2000, and in the Australian Capital Territory, in May, 2010. Mr Foley was joined by Shadow Health Minister, Mr Walt Secord, and Labor candidate for Gosford, Ms Liesl Tesch, on March 13, to make the announcement. Mr Foley said the location of the Gosford Nurse Walk-in Centre would be finalised in conjunction with the community and the local health district. This will occur in the first term of a Foley Labor Government. To visit a Nurse Walk-in Centre, a Medicare card would be required for admission; however, a fee would not be charged. “The Nurse Walk-in Centre will complement, not replace, existing primary care services. “They will see patients in ‘treatment rooms’, which will differ from GP consulting rooms. “A treatment session can last up to 30 minutes longer than a traditional GP visit. “Nurses will be able to provide a sick/carer certificate, but they will not have the legal status of a medical certificate. “Patients with a serious, complex or ongoing condition will not be treated and will be re-directed to the most appropriate medical practitioner or an emergency department. “Motor vehicle and workplace injuries will not be assessed at the nurse walk-in centre and if a client presents with a major injury, nurses will call an ambulance. “A summary of the visit will be prepared and sent to the patient’s nominated GP. “Existing regulations and rules on dispensing and supplying of medicines by nurses will apply,” Mr Foley said. State Labor also reiterated their opposition to the Liberal State Government’s plan to privatise Wyong Hospital, which will put extra pressure on Gosford Hospital. “Labor is committed to a public hospital system; not the Americanisation of the NSW health and hospital system,” Mr Foley said. 37.6 per cent of Gosford Hospital patients waited longer than four hours in emergency department. Four hours is the national benchmark. 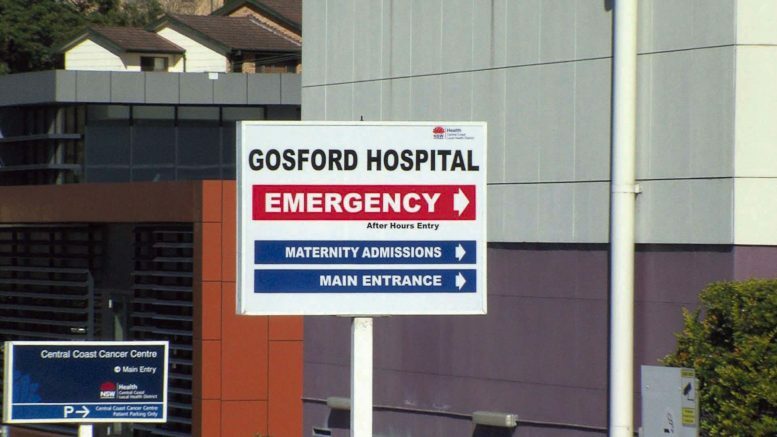 Gosford was one of the State’s busiest emergency departments outside Sydney, with more than 65,000 patients a year visiting the ED. Forty-three (43) per cent of patients at the emergency department were in triage four and five categories, meaning that they presented with “small cuts, ear aches and abrasions”. These were ailments that could have been treated by a GP, however, low levels of bulk billing GPs meant that patients were forced to resort to the emergency department; and in the last three months, 820 patients had to wait longer than eight and a half hours in emergency departments (Source: BHI – June to September 2016 quarter released December 2016). “Gosford is a growing community and its hospital is under enormous pressure. “We need innovative ways to relieve pressure on our bursting emergency departments. “Many families are forced to visit emergency departments with minor ailments because they cannot get into a GP. “Emergency departments should be used for genuine emergencies only,” Mr Foley said. “I am deeply committed to the region and want to ensure that our hospital is properly resourced. “That is why I am supporting new measures like a Nurse Walk-in Centre at Gosford. “For too long, families and patients in Gosford have been neglected by the Liberals. “It is time that patients got their fair share of resources and support at the hospital,” Ms Tesch added.